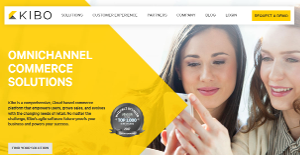 Kibo Commerce is an omnichannel eCommerce platform designed to unify consumer experience by integrating eCommerce, logistics, and retail enterprise. This cloud-based commerce solution encourages users to improve the way they do business by introducing changes to their commerce sites, stores, and supply chains without having to use any code or heavy customization. With Kibo, businesses can easily adapt to the ever-changing needs and demands of their market, making their enterprise ready for the future and its challenges. The software enables companies to be in full control of their online presence, covering important facets of online operations such as commerce, branding, customer engagement and publishing from a single, centralized location. Kibo delivers a throng of features and capabilities that help you amplify your business potential and drive business growth. With Kibo, your commerce sites, online stores, and supply chains perform better and generate more revenue while saving you time and money. The system’s agile omnichannel solutions enable you to take out silos and help you improve the way you handle fulfillment, inventory, merchandising, and customer interactions. Your business needs to create cross-channel consistency, achieve seamlessness, and deliver individualized brand experiences for every customer. Kibo is loaded with the tools and capabilities to help you do just that and more. Along with its tools that empower you to perform better, Kibo simplifies business management as it puts all your B2B and B2C omnichannel needs in a single location. That means you don’t have to open multiple applications simultaneously to manage all aspects of your business. With Kibo, handling all facets of your commerce is quick and effortless. Kibo’s eCommerce solutions grow with your business and evolve as the market evolves. With easy and automatic upgrades, Kibo helps proof your business for the future. You will have all the upgrades and the latest omnichannel capabilities that you can utilize to top the competition and take your business to higher heights. If you are interested in Kibo Commerce it might also be beneficial to analyze other subcategories of Best eCommerce Software gathered in our base of B2B software reviews. Since each company has specific business wants, it is prudent for them to desist from seeking a one-size-fits-all perfect software system. Needless to say, it would be useless to try to find such a system even among market-leading software applications. The intelligent thing to do would be to list the various essential factors that need consideration such as main features, finances, skill levels of workers, company size etc. Then, you should do your groundwork thoroughly. Read some Kibo Commerce reviews and look into each of the other solutions in your shortlist in detail. Such in-depth groundwork can make sure you weed out ill-fitting platforms and zero in on the solution that provides all the aspects you need for business success. How Much Does Kibo Commerce Cost? We realize that when you make a decision to buy eCommerce Software it’s important not only to see how experts evaluate it in their reviews, but also to find out if the real people and companies that buy it are actually satisfied with the product. That’s why we’ve created our behavior-based Customer Satisfaction Algorithm™ that gathers customer reviews, comments and Kibo Commerce reviews across a wide range of social media sites. The data is then presented in an easy to digest form showing how many people had positive and negative experience with Kibo Commerce. With that information at hand you should be equipped to make an informed buying decision that you won’t regret. What are Kibo Commerce pricing details? What integrations are available for Kibo Commerce? If you need more information about Kibo Commerce or you simply have a question let us know what you need and we’ll forward your request directly to the vendor.